To be a musician is a gift. The primary role of a musician is to perform music at such a level that it ultimately enriches the life or soul of the listener. To paraphrase Plato, “Music is food for the soul”. As an educator, my goal is to impart both physical and mental skills to enable students to have total control of their instrument, giving them the freedom to focus solely on making music and connecting with the audience. This is accomplished through a variety of methods. As a former student of Vincent Cichowicz and Adolph Herseth I come from the Chicago tradition of brass performance. However, as a former student of Manuel Laureano I am aware of the New York (Vacchiano) traditions of brass performance. Following many of the teachings of Arnold Jacobs, I believe that good tone and technical fluidity are the result of a relaxed and constant airflow. Students are instructed in proper, relaxed body alignment and the benefits associated with it. Music is an aural art, and tone production should be any musician’s main objective. Proper tone production leads to increased ability and ease of technique. Students are instructed on proper execution of fundamental techniques using standard materials such as: Arban, H.L. Clarke, Schlossberg, Cichowicz flow studies, Concone, Rochut, Goldman, Brandt etc. The student’s ability to execute these fundamental exercises determines what level of etude, (Herring, Charlier, Bitsch, Williams, Bousquet, Pietzsch, etc. ), solo (standard repertoire) and orchestral excerpt assigned. There is no substitute for practice and hard work. I believe in the old saying, “Failing to prepare, is preparing to fail.” Students are required to practice no less than 21 hours per week and to maintain practice logs. Currently, American Universities and Conservatories are producing an overabundance of qualified musicians to fill the limited number of openings in the music industry. I believe that the days of a student graduating with the ability to play 50 excerpts and win an orchestra audition are over. Orchestras are performing more and more pop/contemporary music all the time. Broadway shows are under attack by the virtual orchestra, Jazz venues are closing around the country. 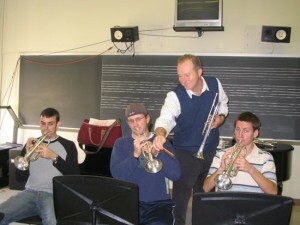 Students must be able to play in a variety of styles. Contemporary Pop Culture throws a number of new obstacles at the traditional music industry. Consumers have more choices for their entertainment dollar than ever before. Each day brings a new technological advancement that many view as threats to traditional music making. I encourage music students to embrace the technology and derive new ways to use it for your own benefit. Today’s students can reshape what a concert or musical experience has been and create something new and fresh. This may be done with technology or with words. I encourage my students to speak knowledgably to their audience. Public speaking is a necessary skill for today’s musician. I view each student individually. Young musicians hold the future of the art form in their hands. I hope to help each student unlock their potential for their own individual benefit and the benefit of music in the future.